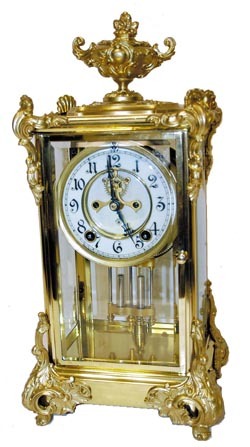 Ansonia Clock Co. crystal regulator, "Marquis", C. 1904. The case body which is polished brass, and the case ornaments, has been refinished in a gold that closely resembles the polished brass. The clock was completely redone by Bruce Baziluk. It is clean and polished inside and out including the imitation mercury pendulum, 2 piece porcelain dial, the rings, the open escapement mechanism, and even the original hands. The clock stands 15.5" high, has 4 beveled glasses, all but one with teeny tiny corner nicks. I sure wouldn\'t spend $100 to replace them. 8 day round movement is signed, has a rack and snail strike count, and strikes half hours and hours on the ornate standing gong. Ly-Ansonia #334.